Before we start working on your oven, we will lay down dust sheets to protect your floor. We have everything that we need with us apart from the hot water. We strip down the oven, taking out the racks, seals, light cover and any other parts that can be removed. These are all put in a heated tank in the back of our van. These are then left to soak while we work on the rest of the oven. In 90% of cases, the oven door can be removed and the doors split so we can clean both sides of the glass. So, if any grease has got in between the glass we will be able to clean it off, unless it’s a sealed unit! Everything is cleaned using specialist tools and cleaning products. 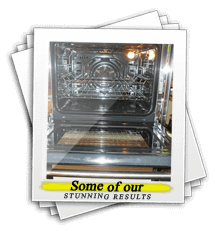 Most customers don’t want to use their ovens afterwards, because they like to keep looking at how fantastic their gleaming oven looks! We don’t make any mess. We can also replace broken oven bulbs and dirty extractor filters for you. Ovens aren’t the only thing we clean. We can clean your microwave (including combination microwaves), Dishwashers, Fridges and freezers – either your undercounter ones or your stand up ones – we can clean them all.